Rolling Stone is sharing "Blood and Rockets" from South of Reality, as well as an interview with Claypool and Lennon about the new record, which they say "feels like an organic extension of Monolith of Phobos, blending the wildly surreal and psychedelic with satirical social commentary." Additionally, Rolling Stone calls the new track "Blood and Rockets," "a sprawling epic that finds Lennon and Claypool crooning and snarling, respectively, over spacey synths and chiming guitars." 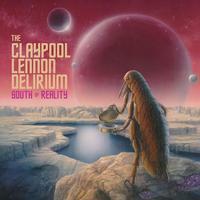 Grab your goggles and a month's supply of Kool-Aid because The Claypool Lennon Delirium is about to take you for a ride on a rock ‘n' roll rocket ship, and frankly you may never come back!